The Astronomical Society of the Pacific (ASP) was founded in 1889 by a group of Northern California professional and amateur astronomers after joining together to view a rare total solar eclipse. The ASP's earliest purpose was to disseminate astronomical information -- a mission which has flourished with astronomers' inexhaustible exploration of the universe. The ASP has become the largest general astronomy society in the world, with members from over 70 nations. The ASP Board of Directors and the Advisory Council are comprised of members of the astronomical, educational, and amateur communities. The Astronomical Society of the Pacific increases the understanding and appreciation of astronomy by engaging scientists, educators, enthusiasts and the public to advance science and science literacy. 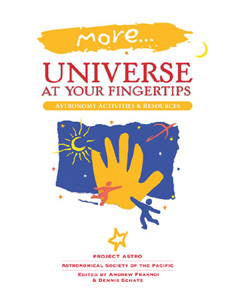 The ASP's mission-based astronomy and space science education and public outreach activities work to promote science literacy through the enjoyment of astronomy. We are a recognized leader in the field of astronomy education. Our free teachers' newsletter, The Universe in the Classroom, is posted on the web. With the support of nationally recognized corporations and individual benefactors, the ASP sponsors Project ASTRO, an innovative program to pair amateur and professional astronomers with teachers and classes in the San Francisco Bay Area and also works with the ASTRO National Network with sites in 13 locations across the country.